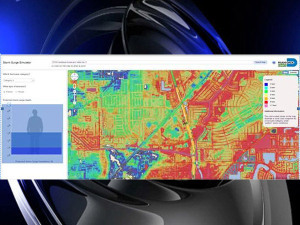 MIAMI (CBS4) — As South Florida tracks Hurricane Irene and on the 19th Anniversary of Hurricane Andrew, a new tool has been launched for Miami-Dade residents regarding the threat of storm surge. County residents can now use the Storm Surge Simulator which combines historical data and modern day technology to see what storm surge can mean to them and their property. Storm surge is the primary reason why Miami-Dade residents are asked to evacuate prior to a hurricane event. With the new Storm Surge Simulator, residents type in their address, pick the intensity of the hurricane (Category 1-5), select the image of a person or home, and let the simulator do the rest. For those living in Evacuation Zones, the simulator is a reminder of the potential impact of storm surge. More than a half a million people live in one of Miami-Dade County’s three Hurricane Evacuation Zones. To try out the simulator, go to www.miamidade.gov. The Storm Surge Simulator is made possible through a partnership between Miami-Dade County’s Department of Emergency Management and Florida International University’s International Hurricane Research Center and School of Computing and Information Sciences. 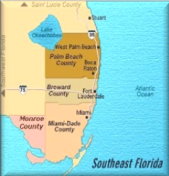 The initial Business Continuity Information Network provides coverage of Miami-Dade, Broward, Palm Beach, and Monroe counties in cooperation with each county’s emergency management office. Participating companies include IBM, Wal-Mart, Office Depot, Verizon Wireless and FloridaFIRST—a consortium of Florida’s financial institutions focused on business continuity. Read about our Partners and Roadmap for more details. We have several research and application publications in conferences and journals. For more information, please review the Publications page. Please contact us at info@bizrecovery.org for information about the service. The Business Continuity Information Network is funded by the School of Computing and Information Sciences at Florida International University as a public service to the community. We wish to acknowledge the generous support from the Department of Homeland Security via Grant # 2009-ST-062-000016 entitled “Information Delivery and Knowledge Discovery for Hurricane Disaster Management”, DHS Grant # 2010-ST-062-000039 entitled “A Research and Educational Framework to Advance Disaster Information Management in Computer Science PhD Programs,” the National Science Foundation via grant NSF HRD-0833093 entitled “CREST: Center for Innovative Information Systems Engineering,”, and IBM through its Shared University Research Program. Provides an overview of the BCIN project, mission, strategy, objectives, and implementation. Download.